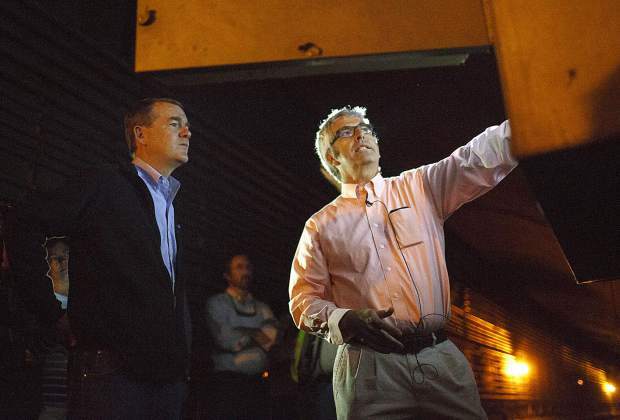 Sen. Michael Bennet, left, listens to Steve Havelson, an engineer for CDOT, while touring inside the Eisenhower Tunnel on Aug. 23 on Loveland Pass. There’s something wrong with our politics. That was the frank assessment of Democratic U.S. Senator Michael Bennet on Wednesday as he took a tour of the Eisenhower Tunnel on Interstate 70, perhaps the most important link in Colorado’s underfunded and overburdened transportation infrastructure. “We don’t even have the decency to maintain the roads and bridges, the assets and infrastructure that our parents and grandparents had the decency to build for us — much less build the infrastructure our kids are going to need in the 21st century,” he said as cars and trucks whizzed by. During peak season, nearly 5,000 vehicles pass through the tunnel every hour. Each of the past three years has seen record-breaking traffic counts, a trend that the Colorado Department of Transportation expects to continue. “Even in the midst of all the construction over the past five years, (traffic) has been going up about 5 percent a year,” said Steve Harelson, west program engineer for CDOT Region One. But like most transportation infrastructure in Colorado, the tunnel is old. Walking through the tunnel facilities, that age is often on display, with banks of modern traffic monitoring screens juxtaposed with clunky Cold War-era switches and dials. There’s a lot to replace and fix up, but that’s the story across the whole state; CDOT estimates that it currently has $9 billion in unfunded priorities, which politicians from both parties warn could put a damper on Colorado’s strong economic growth. Compared with Congress, the Colorado Legislature is a picture of comity and cool-headed compromise. But a monthslong effort to fund CDOT through a tax increase still foundered last session after Senate Republicans bucked their leadership and killed the bill. A congestion-easing project along the I-70 mountain corridor may be among the casualties. For about $70 million, it would add westbound overflow lanes like the ones that have reduced travel times on the east side. For now, though, the project is chasing money that just isn’t there. Interest groups plan on proposing a ballot measure to increase transportation funding, but it’s not clear when that could come to voters. When it does, CDOT says it has a long list of projects that it hopes could sell the idea, whatever form it takes. At the federal level, meanwhile, there has been little movement on an infrastructure bill despite support on both sides of the aisle. The issue, seen as a rare unifier in Washington, has gotten bogged down by other legislative priorities and overshadowed by the drama of the Trump presidency. On Aug. 15, for instance, President Trump unveiled a new executive order to speed up approval for infrastructure projects, but the move was eclipsed entirely by his impromptu comments to reporters about deadly protests in Charlottesville, Virginia, as he left the lobby of Trump Tower.